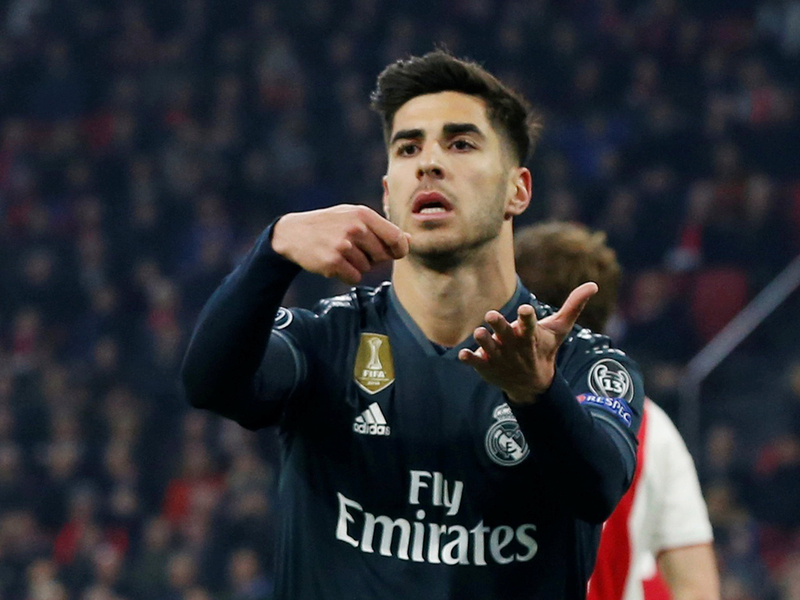 Amsterdam: Real Madrid needed a late winner from Marco Asensio and VAR’s debut in the Champions League to beat a spirited Ajax 2-1 in the first leg of the last 16 on Wednesday. Hakim Ziyech’s equaliser at least keeps Ajax in touch heading into the second leg at the Santiago Bernabeu but Asensio’s 87th-minute winner was a sucker-punch in a match the Dutch team had largely dominated. Their ruled out opener will likely only add to the sense of what might have been and it was no surprise to see a cluster of red and white shirts surrounding the officials at the final whistle. VAR has been introduced to the Champions League for the first time in this year’s knock-out stages and leaflets were distributed to the media before kick-off, one of the points explaining that reviews should only be made for “clear and obvious mistakes”. Tadic’s intervention on Courtois was minimal and even if he was just offside, it seemed generous to judge he had made enough of an impact on the goalkeeper to be penalised. Still, there was more than an hour to play and Ajax were twice too easily undone on the counter-attack. Frenkie de Jong, who will join Barcelona in the summer, and Matthijs de Ligt, who could follow him, were each dealt a harsh lesson in the ruthlessness of top European football. Ajax fans had put on an impressive display of fireworks late on Tuesday night outside the Spanish team’s hotel and perhaps it paid off because Madrid were run ragged in the first half. Courtois skewed an early clearance, Casemiro miscontrolled and Bale swung a frustrated kick at De Jong’s shin. Tadic had the first chance as Sergio Reguilon’s poor pass was headed into his path, a sliced finish beating Courtois’ right hand but not the post. The best opportunity fell to the excellent Donny van de Beek, after the ball was shifted along the line like a rugby move until the midfielder was left spare six yards out. Courtois saved with his legs. Hero one minute, villain the next, Courtois then fumbled De Ligt’s header from the corner and Tagliafico headed in. There was no protest from Courtois but Skomina pointed to his earpiece. Tadic had brushed past Courtois as the header looped in and was deemed offside. The crowd jeered at half-time and Benzema compounded their misery soon after. It was a goal to sum up Madrid’s resurgence in recent weeks as Luka Modric flicked a ball for Vinicius Junior to race after. He tore past one, jinked inside two more and teed up Benzema, who found the top corner. Ajax refused to fade. David Neres and Tadic both went close before Neres skipped free down the left and crossed for Ziyech to slide in the equaliser. Madrid wanted a free-kick for a foul on Lucas Vazquez in the build-up but this time the goal stood. A draw might have appeased the home fans but they were denied even that as a slick move through midfield freed Dani Carvajal down the right. His cross found Asensio, who could not miss.